There’s a tabletop RPG maxim that monsters determine setting, and while it can be taken too far there’s definitely a bit of truth to it. The antagonists faced by players and their characters, especially in an emergent game (by which I mean one with a sandbox or where the player’s decisions and interests otherwise largely set the tone and nature of the game’s locales, enemies and intrigues) the players opinions and goals are likely to be at least partially formed by how they feel towards certain early encounters. The death of a character in the first game to goblins can make the player angry enough to devote several sessions to being goblin eradicators for example. In a game where the goblins are replaced with bandits, draconians or halflings there will be a very different tone to these subsequent adventures. Of the original D&D booklets - tiny ugly things published in the mid 70's - the second is titled "Monsters & Treasure" and contains Dungeons & Dragons ur bestiary, with 68 or so monsters (or classes of monster, it's not always clear). Reading through these I can't help but wonder what kind of implied setting this set of adversaries make for. 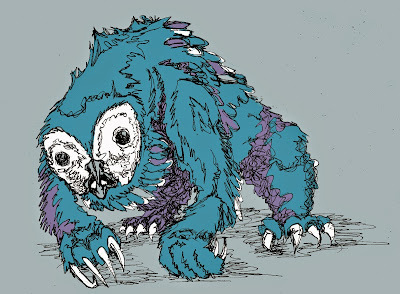 The monsters are not ordered in any real way in Monsters & Treasure, though the idea that they are listed from most common to rarest is a bit appealing, secondly the descriptions of these Monsters are heavy on practical details, such as the weapons mixes of human and humanoid enemies, but sparse on ecology, description or other evocative detail. It seems interesting to me to take a look at a few of the monsters and to think about how to use, describe and elaborate on the various Monsters & Treasures enemies. For this I have decided to tie my reskins (minimal I hope) to my Fallen Empire setting (the place where I play around with vanilla tabletop fantasy concepts). I won’t be commenting on the statistics of these monsters except generally, because OD&D statistics are quite simple and really rather easy to imagine on the fly. The first entry in Monsters & Treasure is either incredibly monstrous or terribly mundane – Men. It is also the longest entry and comprises at least seven subcategories (for my purposes Cavemen and Mermen will be separate monsters, but they likely shouldn’t be). The category of Men includes various dangerous types inclined towards robbery and violence: Bandits, Berserkers, Brigands, Dervishes, Nomads, Buccaneers & Pirates. Composition of Force: Light Foot (Leather Armor & Shield) = 40%; Short Bow (Leather Armor) or Light Crossbow (same) = 25%; Light Horse (Leather Armor & Shield) = 25%; Medium Horse (Chain & Shield, no horse barding) = 20%. All super-normal individuals with the force will be riding Heavy, barded horses. Bandits then aren’t scruffy types one encounters here and there a handful at a time, they are legions of warriors, encountered in groups of 3D100 and led by powerful and special NPCs. 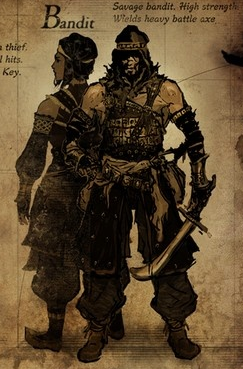 Bandits seem to have a degree of military organization and certainly military equipment, albeit not the best, and they aren’t necessarily evil. My own mechanical inclination is to make the encounter number (for everything in Monsters & Treasure) the number of the monster type residing in a hex rather than a single encounter. A bandit band of 200 presumably has infrastructure to guard (A camp at least) and not all of its force will be set in ambush (without good reason). Instead smaller groups of bandits will watch the road, patrol their perimeter and generally act as random encounters, and will warn the camp/fort if they encounter anything dangerous. What the numbers, organization and powerful leaders of bandits seem to imply is that they aren’t just robbers, highwaymen or thieves, but entire armies of misrule. That they can roam the countryside (along with their less pleasant offshoots) without interference implies a lack of social order. In Monsters & Treasure “Bandits” imply two possible things about the setting. First that there is some sort of rather nasty and titanic war occurring (or perhaps just ended) in the game-world, leaving large bands, full military units up to size of a small battalion roaming the countryside and preying on travelers. The Second, and perhaps less apocalyptic world building implication from the bandit entry is that the bandits aren’t really ‘bandits’ in the classic sense of highwaymen, but rather the local forces of order outside any sort of legal structure or control. The local lords, barons, mayor, cult leaders and other leader types have large armed bands of militia or retainers and they tax whatever comes through their domains heavily. Below is a new sub-class of Cleric I have been preparing for my Fallen Empire setting, it's an evolution (perhaps the final one) of the 'casting die' based spell mechanics that started with animal shaman in the Pahvelorn campaign and which I currently use for some clerics in HMS Apollyon. I generally like this system for divine magic as it makes it unpredictible and strange without adding too many new rules. It also allows player imagination to expand the spell list by inventing new patrons, which makes it potentially very fun for players who enjoy world building and setting immersion. A PDF of the class can be found HERE. Within the Successor Empire there is only one religion of power, the Imperial cult stands alone and falsely claims a spiritual unification. The Cult’s claim is disingenuous as it has birthed a thousand little schisms, divergent traditions, and is big or vacuous enough to contain almost any beliefs. 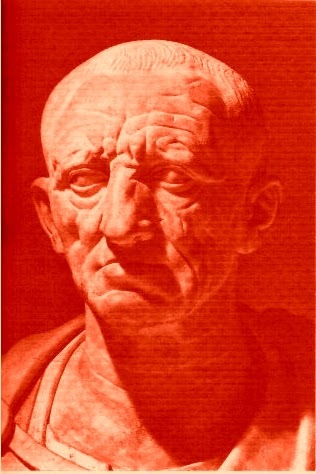 The Cult worships the Emperor, and while the qualities of the imbecilic Zeno the 14th, current and 754th Emperor (210th of the Successor dynasty), do not lend themselves to worship even his devotees receive mystical power from their belief. There are hundreds of other Imperial Emperor Saints that also grant power, and many of them conceal the syncretic adaptations of other conquered religions, often worshiped under multiple names. The spirits of individual emperors offer their devotees unique powers based on a special religious portfolio, and while most priests limit themselves to one or two preferred saints, a few of the most powerful, half saint themselves, can channel many different divine spirits. However, even these greatest of holy men and women can only call upon one power at a time and must wear the correct panoply to do so. Erik Jensen is one of the first GM’s who I played with online and I have always enjoyed his games, set in Wampus Country, a tall tale version of the frontier, but only vaguely American. He’s a great GM, who runs a very free form game, short on maps or metrics but long on NPCs and unique situations. I don’t know Jason Paul McCartan except as a G+ poster and the author of the OSR today blog - a well designed blog aggregator and curation site. 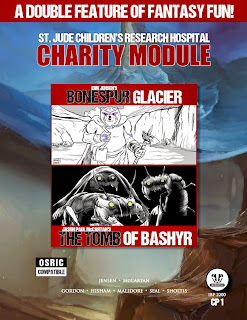 Still, I was excited to see that the pair of them had produced a “double feature” set of adventure locals and were offering them as pay what you want on RPGnow with the proceeds going to charity (St. Jude Children’s Research Hospital). The product is a 23 page PDF but at least 5 or six pages are filled with art, content pages, an ad for a talented mapper and the OGL. Nothing wrong here – the product is a fine example of independent game publishing and the art and layout is very professional and decently done, if often in the somewhat forgettable way of post 2000 WOTC product. The two maps are also rather exceptional, being the work of Monkeyblood Design (Glynn Seal) who is one of my favorite mappers working today. Rations have been on the equipment list for D&D since it’s earliest incarnations In the first game I played (Keep of the Borderlands of Course) the GM insisted that each PC buy one Iron Ration (A term perhaps originating with the 1907 – 1922 US military individual ration, and including parched wheat and beef bullion cakes) but it was never heard from again. Now rations have uses – specifically to throw to animal intelligence monsters to distract them, and theoretically the party eats them at some point, but they are largely not mechanically significant. They should be in an exploration game however and below are my house rules for HMS APPOLYON regarding food and exhaustion. The Dungeon is a strange place, filled with the physical challenges of climbing, fighting and forcing doors as well as the stress of intruding into a terrible, magically charged nightmare. A lot of people deal with stress and strain by eating, and there is nothing like a quick bite to restore a person physically and mentally. Exhaustion is modeled as a random effect on the “Exploration Die”, rolled every turn. When a ‘6’ results the party takes an exhaustion pip, and when three pips accrue the characters have become exhausted. Exhaustion is a state of being overwhelmed physically and mentally by the rigors and horrors of the Apollyon, the stink of old death and rotten metal, the creaking of the tired hull and hissing whispers of the damned all take their toll, just as much as climbing slime encrusted chains or swinging a crowbar into the skull of another zombie. When exhausted characters receive a -4 to all rolls, cumulative to any other negative effects for darkness, injury or encumbrance. Below is a short (4 Page) PDF of an idea that didn't quite fit as a one page dungeon. It's likely better than the one page dungeon I did submit this year, but I just couldn't cram it down in size enough to work. I'm not fully happy with the adventure, which is obviously some high level fare given that the enemies include a chamber of 35 specters. However, I think a good 3rd or 4th level party might be able to survive the Mountain, as it's secrets don't require encountering any of the really dangerous creatures, and running the adventure as a stealth mission might be more fun then as a regular exploration type adventure.Though the stealth mission would likely be "Drop the kidnapped baby Prince/Princess into the volcano" so not really a feel-good romp. The whole thing becomes fairly straight forward if the party has ways of becoming immune to fire, which I am unhappy with, but then it's not may favorite adventure, and a walking mountain as engine of destruction really deserves a larger dungeon. Why am I reviewing this tiny module, lacking in slick art and a name brand pedigree? I am reviewing it for a couple of reasons, the first is that I know and like the author, but more importantly, The Bloodsoaked Boudoir of Velkis the Vile is the sort of hobby product that I have come to appreciate the most about DIY tabletop - it's produced out of a joy in playing tabletop games and with creativity and an esoteric view of the game rather then as part of a product line for sale and consumption. Even the DIY products I like are often fairly expensive today, and I see egos growing behind the success of these more ambitious products, a success that seems to fuel greed and cattiness among other would be creators. RPGnow is filled with short, derivative and generally awful vanilla fantasy blather that has the audacity to ask for money. One of the key joys of tabletop has always been that it asks the consumer to create - from the empty 1/2 of B4 Lost City on the best tabletop RPG products have encouraged GMs and players to build their own fantasy worlds. As such any published product will always be ancillary, and when a creator asks consumers to use their setting materials and modules they are asking them to do more then hand over a few dollars, they are asking to hand over a chunk of their creativity and imagination as well, which is not something one should do with arrogance. Bloodsoaked Boudoir is not an arrogant product, it's small and can fit into another game with some ease, while still being interesting enough to give an evocative sense of it's authors sort of game and game world that is different enough from the standard 'orcs in a hole' fantasy adventure to provide interesting ideas, and leave a reader with the sense that maybe they wouldn't have thought of it themselves. With all these advantages the author is happy enough to simply publish his work as a pay what you want PDF, rather then promote it and clamber for your cash. Manifesto done, on to the review. I've played with Nick Whelan a bunch of times, and rather enjoyed his Dungeon Moon setting of which the Boudoir of Velkis was a part - Velkis was one of the two sub-deities that the Dungeon Moon party managed to eliminate during a year or so of games. I will say it was a fun game when run by Nick, and would likely be a fun setting run by anyone. The party encountered Velkis (the titular villain) numerous times, and thought of him as an annoying random encounter that was far less dangerous than most. Only the warnings of a friendly kobald tribe revealed the true danger of Velkis and the adventurers decided to assassinate him - leading to one of the more psychedelic sessions of D&D that I have played. The Bloodsoaked Boudoir of Velkis the Vile is a ten page PDF using Lamentations of the Flame Princess stat lines (essentially any OSR/retro-clone system should work) published as a pay what you want adventure on RPGnow. It's a small five area dungeon with a few functional pieces of art that fits well on a more gonzo random encounter table - drop in Velkis and place his extra-dimensional grave/lair somewhere nearby, and you've laid a potential one session adventure that's pretty good and plenty bizarre. Velkis. Velkis is rather insane and utterly lacking in the skeletal majesty of most liches, passing himself as a doddering grandfatherly figure rather then a puissant undead immortal. Yet, Velkis is dangerous and perverse despite his appearance - perverse in the manner of an 70's shlock horror movie, and this is what makes him fun. The module bills itself as "horror-comedy" and that's how I'd run it. Velkis is a creep who lurks at the bottom of the random encounter table and has the power of persuasion. He's a good villain because it's unlikely that he can kill or injure party members on the first encounter, he really seems pretty harmless - but he's effectively immortal and he's damn inconvenient. He's also terrifying, effectively designed with powers that could be very, very dangerous but which are badly used. Velkis can steal away and murder a party member or two and if he's ignored and laughed at (exactly what he wants I think) he may become a real nemesis for the party.